Donald Trump is just like the rest of us. Or at least he was on Monday morning, when the billionaire real estate mogul and Republican front-runner reported to a Manhattan courthouse for that most trying of civic responsibilities: jury duty. Photographers captured Trump early Monday morning as he arrived at the State Supreme Court of lower Manhattan in a black stretch limousine — so, maybe not quite like the rest of us — and headed into the clerk's office for a long day with his fellow New Yorkers. And thanks to one diligent Manhattanite who took a Snapchat photo of Trump waiting for jury duty, we have firm evidence of a time where the GOP candidate really did look like any other voter called for jury duty: bored and sleepy, with maybe a smidgen of irritation. 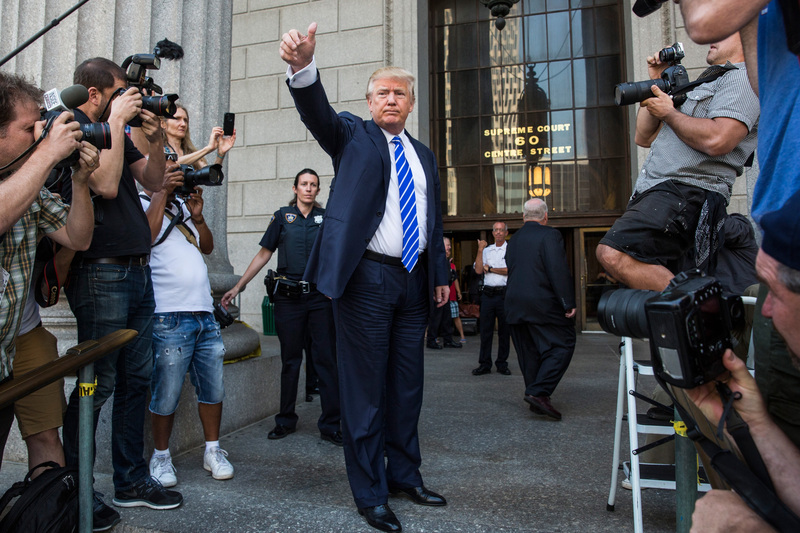 Trump arrived at the courthouse on Monday fresh from a campaign stop at the Iowa State Fair. He took a break from campaigning to come back to New York in response to a jury summons. This makes the sixth time Trump has been called for jury duty in New York. Back in June, the New York Daily News reported the businessman had ignored five previous summonses from the Manhattan County Clerk over the past nine years. In an interview on CNN's New Day, Trump's Special Counsel Michael Cohen told the hosts the real estate mogul had missed the other notices because they'd been sent to an address where Trump didn't actually live. Cohen also told CNN that for ignoring five prior court summonses, Trump faced a $250 court fine on Monday, but if the businessman completed the full day of jury duty this time, those fines would be waived. When host Chris Cuomo asked the candidate's chief adviser whether Trump was a "jury skipper," Cohen maintained that it was all a misunderstanding. Not true. You gotta serve it to the right property. ... I believe he owns the building but he doesn't reside there. Nobody knows what happened to the document. He seemed in deep thought about his campaign. He's a nice guy, a funny guy. He seemed pretty bored like the rest of us. A Snapchatter caught a candid shot of The Donald that bears out Hamburger's impression of Trump. This photo of Donald Trump shows the billionaire just blending in with his fellow New Yorkers. The Daily News also reported Trump chatted with several other potential jurors while he waited for the clerk to call his name, answering questions from bystanders about immigration and his campaign's progress. Yes, for one day at least, Donald Trump made jury duty great again. A spokesperson for the Manhattan court told reporters covering the day's proceedings that potential jurors called for duty in the city typically serve for one to two days or one trial. For serving his civic duty this week, Trump won't be called for jury duty for another six years. By then, if the latest Republican poll numbers are any prediction, the presidential hopeful would be well into his second term of office.